Get an Emergency Electrician in London even at Short Notice! Do you need an emergency electrician in London? We’ve got the perfect service for you! Widely available, and contactable 24/7, our highly trained team of electrical engineers can be with you in an incredibly short space of time, thanks to the fact that we’re based in the local area. No matter what the scale or sophistication of your electrical malfunction we’ll be able to deal with it professionally, utilising the many years of industry experience that our team possesses. So when you need a London emergency electrician turn to the area’s most popular service. You’ll be getting a highly qualified domestic electrician with a range of the very best tools and equipment currently on the market, but more importantly you’ll be getting the peace of mind that comes from a team that’s been fully vetted and police checked, and that is covered by full insurance. Weekend and evening appointments: make your booking for whatever time suits you – we offer early morning and late evening appointments throughout the week! Great reviews: check out our customer reviews page now and you’ll see why we’re such an enduringly popular choice for domestic electrical services in the capital! 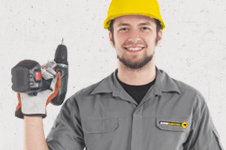 Book Electrical Repairs in London Now! Book London electrical repairs now by calling 020 3746 0607. We offer free, personalised quotes on all of our services so you'll be able to get an accurate estimate on how much your repairs will cost before you even place your appointment. Our customer advisory team will be happy to answer any questions that you might have, and can be contacted via our online booking form and our instant web chat support facility too! We offer 24/7 customer cover and advice across the board. You'll be able to get an emergency electrician in London at incredibly short notice, plus we have a whole range of other services that can help you with everything from plumbing to installing flooring. Ask our team or visit the relevant service pages now for details!